Without your membership the AWA's ability to speak on behalf of Alberta's paddlers and for our rivers is limited. Your membership strengthens our ability to speak out for our sport. Many people outside our sport see whitewater kayaking as a fringe extreme sport and don't understand the broad appeal and interest in society today of paddling. The 2013 Alberta Recreation Survey found that canoeing & kayaking is one of the top 5 sports that Albertans want to start next year. And more people now go kayaking each year than play hockey, baseball/softball or many other organized sports. So getting you to register as a member is a critical building block for the AWA. Membership in the Alberta Whitewater Association enables you and/or your club to operate efficiently and safely. Clubs can opt to be covered under our insurance plan for a very low fee and you will have access to numerous resources to participate in and run club events. 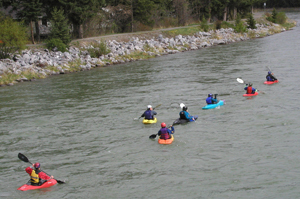 Development of whitewater facilities such as Canoe Meadows, the lower Kananaskis River, the Harvie Passage WW park in Calgary, Boulder Run in southern Alberta and other community based paddling centres. Protection of rivers and access points such as upper Red Deer River, Ghost Dam road, upper St Mary's River, Slave River, Bow River in Calgary. Hosting and support of paddling events and festivals such as Sundre Paddlefest, Provincial WW Championships, 3 Rivers WW Rendezvous, Alberta Cup slalom races, Alberta Freestyle competitions. Protection of your rights to paddle without undue government interference or regulation such as the Transport Canada's boat registration, City of Calgary water closures, or other actions.